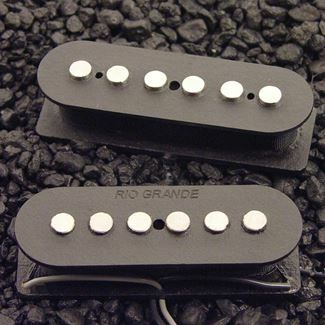 The first ever direct replacement pickup for G&L® ASAT's are (of course) from Rio Grande! The Muy Grande replacement set for ASAT pumps it up to a new level. Thicker, beefier, and overall a fatter tone than the Vintage Tallboy set, the Muy Grandes will never leave you wanting! Neck pickup supplied RWRP. COVERS NOT SUPPLIED ...Use the covers that came with your ASAT. This is not the "light beer" of acoustic soundhole pickups! The Bone is full of meat & potatoes with all the fat, cholesterol, caffeine, and sugar you need for righteous acoustic "Tone to the Bone"! Pops in and out of almost all acoustic guitars easily. Comes in different domestic and exotic hardwoods to match your guitar.....plus, it's just cool! Includes a fourteen foot cable with George L's famous jack, or can be wired direct to an endpin jack!